So, the newest, latest and greatest way to run is ‘naturally,’ right? Mid-foot strike, under your body, short quick cadence and a nice lean forward—this is what’s ideal. Most people do not run like this. Watch someone running down the street, I bet you they are landing first with their heel (sending shock waves up the body,) rolling through the rest of their (maybe over pronating,) and toeing off only to begin the cycle again. What I want to emphasize is the shock starting from the heel and reverberating up the entire body. ENTIRE BODY. So ideally let’s not do that, okay? Let’s all mid-foot strike. We can start a club, The Mid-Stikers…or something more clever than that. Let’s land more towards your toes, under you body (not in front,) and reduce the amount of pain, pressure and shock on the entire body. Well, not all of us are really able to do this with out a bit of help, that’s where your choice of shoes can come in. The kind people at Newton were nice enough to send me a sweet pair of shoes to test out and tell all of you about! Yay! More shoes!! The idea behind Newton shoes are that the lugs under your metatarsals are designed to encourage the Action/Reaction technology in the shoe by Land-Lever-Lift. So essentially you’re running more efficiently, you’re running with less effort and you’ll (hopefully) be at less of a risk for injury. You can read more about this HERE. I’m not going to get super techy on you. The first run I took in them was a lot of climbing up hill. My ladies group run took me up, up and up higher in the mountains, so I was on my tippy toes anyway but could still notice the lugs and my legs working hard. As the run progressed I actually felt a bit unstable in them. 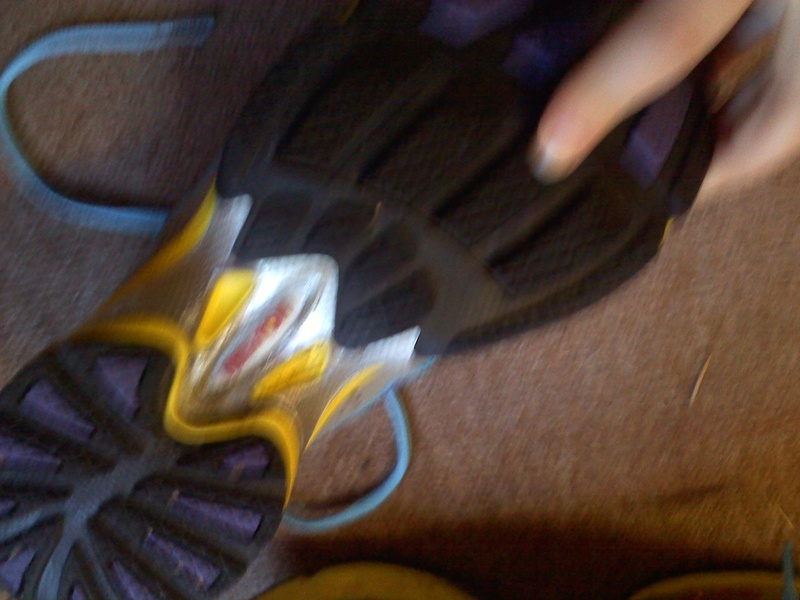 They were about half a size too big, so I should have tied them tighter, so that could have been some of the issue, but none-the-less I still noticed I had shoes on my feet. When we got back from an hour of hills and trails I threw them off my feet and said I’d never wear them again! I was so annoyed with the sliding and the feeling of a pole under the front of my foot and then I realized I was really hungry, and tired and needed dinner and bed, so I apologized and said I would give them another chance in a couple days. 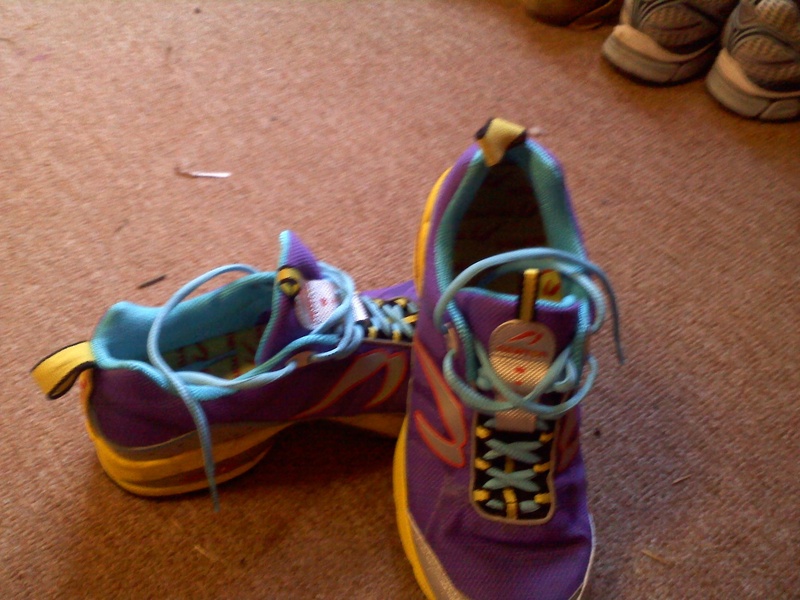 After a meal, a night’s sleep and a run in my normal running shoes I was ready to try the cutie Newtons again. I decided to run a flat loop around my ‘hood to see how these guys feel on pavement. First, a bit of back ground on me: I already run on my mid-foot. I always have, so the heel strike thing most of you guys do isn’t an issue with me unless I’m SUPER tired and like 12 miles in on a city run…so my experience is probably different from most. Just an FYI. As I ran around the city I’m trying to call home I was trying to figure out what I was feeling under foot. I again NOTICED the shoes on my feet. With my normal running shoes I lace up and forget about it. I just run and enjoy the run. with the Newton shoes I felt kinda wabbley. I felt like they were clunky. Not stiff, they are quite cushy actually, just noticeable. I got kind lost on my run, I wanted to eventually end up at the gym, so I just kind of went in that direction and ended up running a loop through a ritzy neighborhood (not where I live, that’s for sure!!) and that’s when the numbness began. I had to stop, shake my feet out, wiggle my toes and then get started again. About 8 minutes later I was happy to have to wait for traffic because I needed to shake my feet out again, annoying! So I got about 25 minutes of ‘notice-my-shoes’ running in, and another 30 minutes of run-walk-shake-run (no this is not a new dance) running in. By the time I got to the gym I wanted them off my feet, but my weight lifting class was starting and the instructor said that it wasn’t allowed. They functioned fine for lifting weights and I got lots of compliments from the old ladies in the class with me about how bright they were, but my feet at this point were craving my slippers. Overall you may think I hate these shoes. I don’t! Like I said before, I probably had a completely different experience with them than someone who heel strikes would have. I would urge you to go find a pair and try them on! They’re weird, but definitely worth taking a peek at if something just isn’t going right with your running. These guys might be a really good option for YOUR feet, just not mine. For now I’ll probably bust them out a few times a month and see if I can start liking them—but for most of my runs I’ll stick to what I’ve been having good luck with.